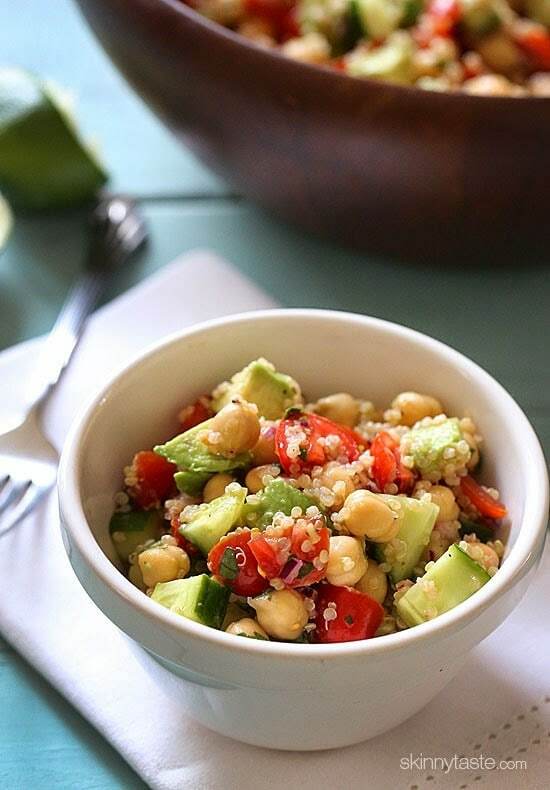 Quinoa chickpea and avocado salad with cucumbers, tomatoes, red onion, lime juice and cilantro – a flavorful vegetarian salad loaded with protein, fiber and healthy fats. 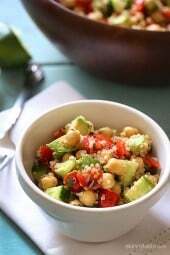 Chickpeas (garbanzo beans) are my new favorite legume. I only recently started liking them in my salads, but now I can’t get enough. Using dried garbanzos taste better than canned, but for speed and convenience, canned is perfectly fine here. This is also vegan, gluten-free and dairy-free and under 250 calories. 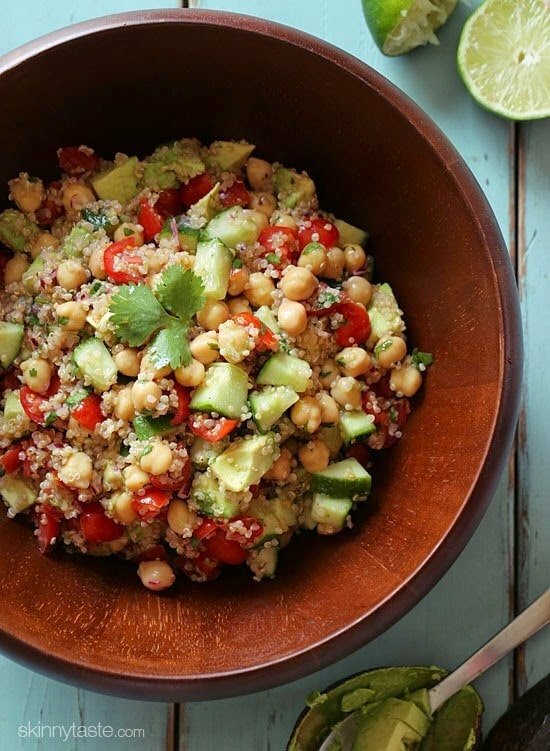 More of my favorite quinoa bowls are Grilled Mediterranean Chicken and Quinoa Salad, Southwestern Black Bean, Quinoa and Mango Medley, and Quinoa ‘Fried Rice’ to name a few. I don’t know about you, but I’m counting the days until summer (54 days to go!!) Living near the ocean, nothing makes me happier than having my feet in the sand with a good book or magazine. But that also means bathing suit shopping (ugh!) and exposing a lot more skin than I did all winter. My solution – eat more salads (and of course exercise)! This salad is perfect for lunch, you can make it ahead, leaving the cucumbers and avocado out, and add the just before your ready to serve. Combine all the ingredients except for avocado and cucumber, season with salt and pepper to taste. Just before serving, add cucumber and avocado.